Learn sushi making from the best! This tour starts in the morning with a walk to the Tsukiji Fish Market. Learn how to choose fresh ingredients in the world’s largest fish market. 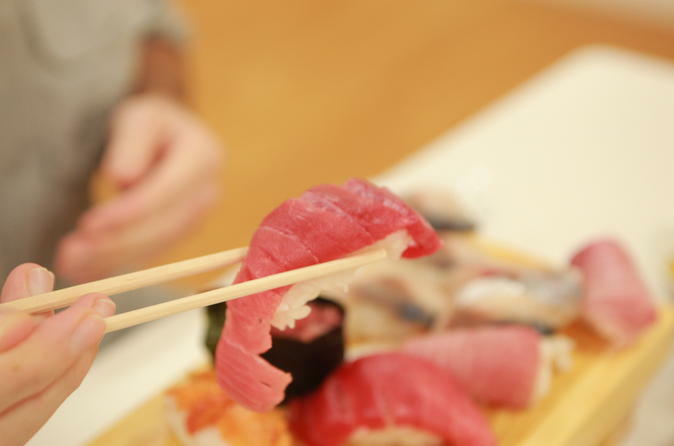 You will be taught by sushi masters with years of experience in Japan's finest establishments. Make your own sushi from ingredients you have just purchased. Another highlight of the experience is sake tasting and you will be able to try 5 ~ 7 different bottles of sake in buffet style. This sushi workshop is lead by veterans of the Tsukiji Fish Market. As such, it is one of the best and most interesting ways to broaden your Japan experience, while learning to enjoy the delicious goodness that Japanese cuisine has to offer. Starting a 9am, you will be taken to the fish market and shown how to choose quality ingredients. This half-day workshop is aimed at those who want to know not only how to prepare sushi, but also how to plan, procure ingredients and present them in the most appealing manner. Since our workshop is located in the heart of the Tsukiji Fish Market, you will have the opportunity to immerse yourself in the history and culture of the world’s largest fish market. All classes are beginner friendly and are offered in both English and Japanese. We look forward to meeting you and giving you a thorough and comprehensive knowledge and understanding of the world of sushi.